The International Joint Commission said in a draft report that urgent steps are needed to curb runaway algae — which produce harmful toxins and contribute to oxygen-deprived "dead zones" where fish cannot survive. The issue prompted both nations to reach their first agreement to improve Great Lakes water quality more than 40 years ago, when some considered Erie ecologically dead. Tougher standards for municipal and industrial waste treatment produced improvements by reducing the flow into the lake of phosphorus on which algae feeds. The report's Canadian co-author, Glenn Benoy, said algae blooms had almost disappeared but now there is a recurrence. "Some of the worst blooms we've seen in the lake happened in the last five to seven years," he said from Ottawa. 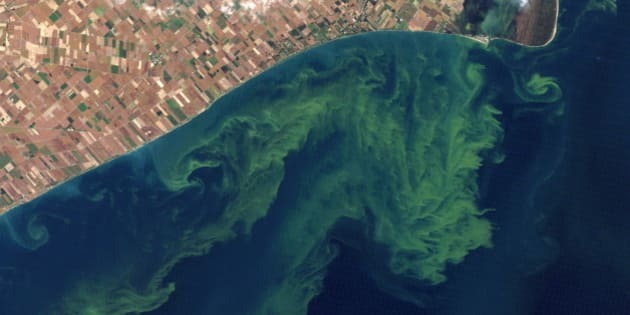 In 2011, the largest mass on record formed in the lake's western basin, eventually reaching more than 160 kilometres from Toledo to Cleveland, Ohio. Benoy — a senior water quality and ecosystem adviser — said there is evidence an algae bloom is starting to spread now, but he doesn't know how severe it will be as blooms tend to peak in the fall. The report says different sources of phosphorus runoff have emerged — primarily large farms, where manure and other fertilizers are washed into tributary rivers during storms and snowmelt. They accounted for more than half of the phosphorus that reached the lake in 2011, while one-third came from smaller farms and nearshore communities as well as city sewers. More intense storms likely caused by climate change are sweeping more nutrients into the lake, the report says. Additionally, unlike decades ago, much of the phosphorus dissolves in water, making it easier for algae to consume. "The ultimate concern is that there will be some toxicity associated with severe blooms and it's this toxicity that can affect human health, animal health," Benoy said, adding that this is in an extreme scenario. The report includes 15 key recommendations, including prohibition of nearly all use of phosphorus fertilizers for lawn care and the monitoring of sewage plants and other facilities that discharge into the lake. It also calls for a cleanup plan developed by the governments of Ontario, Ohio and Michigan. Benoy said other ecosystems surrounding Lake Erie could be affected. "It's not confined to the western basin of Lake Erie," he said, adding that blooms have also been found in Lake St. Clair. He said researchers are looking at a multi-year solution to "turn the phosphorus taps off." The report sets targets for sharp reductions in phosphorus runoff over three to six years, including a 46 per cent decrease in total phosphorus and a 78 per cent cut in the dissolved type for the lake's central and western basins. "The idea that we could turn time back and go back to a Lake Erie like it was pre-war or something, that will take centuries," Benoy said, adding that the goal is to have the lake in an environmental condition that is "desirable and acceptable" to the public. "If nothing is done with the recommendations, well, then we get into a scenario where the likelihood of further blooms continues, the severity, the duration, intensity," he said. "There will be nothing to curtail that." To reach the targets, the report recommends that governments in both countries should require "best management practices" that reduce the amount of phosphorus applied to fields and slow the flow of water to drainage systems. The report suggests one step would be to ban spreading manure on frozen or snow-covered ground. Another proposal would link the cost and availability of government-subsidized crop insurance to farmers' willingness to curb phosphorus runoff. "The idea is that if you're contributing to pollution, you're going to pay more," said Lana Pollack, chairwoman of the commission's U.S. section. "There's really a strong need to change agricultural practices, or else just say you're going to sacrifice Lake Erie." Pollack said if the governments take action on the report "it will make a big difference." "What happened in 2011 was such a shock that people realize more of the same is just not tolerable," she said. _ With files from The Associated Press.